To many of us, Lake O’Hara is THE jewel of the Canadian Rockies. Surrounded by spectacular alpine summits, this emerald green gem is a delight, shimmering in the brilliant light of the summer sun or covered by soft powder snow in winter. Some feel that Lake O’Hara is at its finest in autumn when the golden larches blaze against the blue sky and snow-covered peaks. 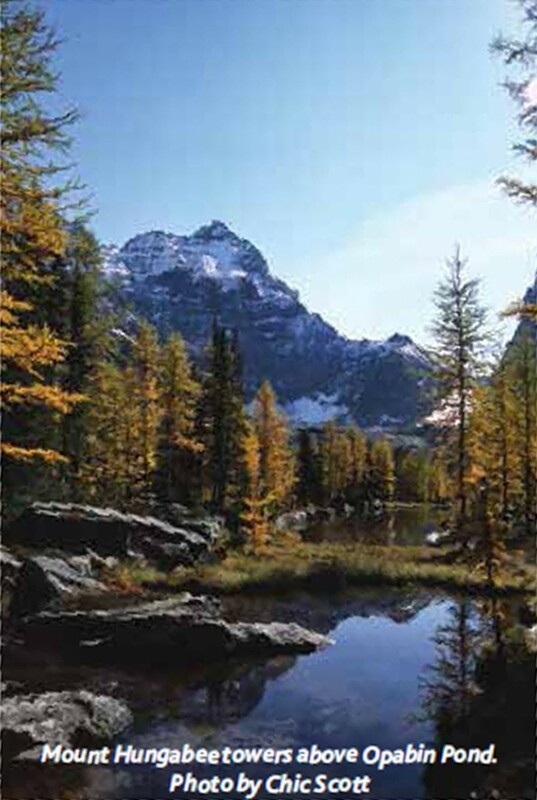 In 1908 in the Canadian Alpine Journal, R. L. Glisan wrote, “Not a trace of human presence, not a trace of any disturbing element, the whole scene was the personification of a majestic peace.” Although not quite as pristine as it once was, Lake O’Hara’s unspoiled beauty has been well maintained by Parks Canada. Unlike many other renowned destinations in the Canadian Rockies, Lake O’Hara is never crowded. 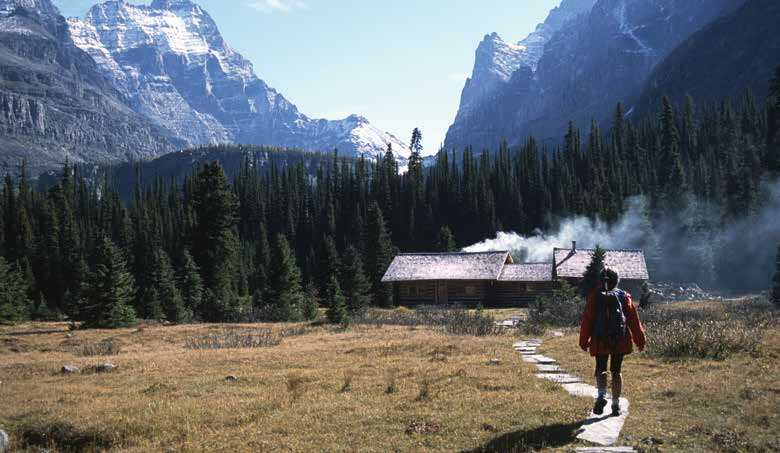 In the mid 1970s a master plan was created whereby only about 250 visitors are allowed in the valley per day: 30 tents at the campground (number of people per site will vary), 24 visitors each at the Alpine Club of Canada’s Elizabeth Parker Hut and Abbot Pass Hut, 60 visitors at Lake O’Hara Lodge, and 42 day users. This means you will never be crowded while exploring the trails – the area is large enough to absorb the visitors and leave lots of space for solitude. It also means that wildlife will not be too badly stressed by our human presence. Access to this magical region is easy: a bus service carries you the 11 km up an unpaved road. If you are willing to walk the distance to Lake O’Hara, there is no quota and no reservation is necessary. Unfortunately, little is known about their connection to the valley, but the lake must have held a very special place for First Nations inhabitants. The region was explored by Samuel Allen, who first accessed the valley by a marathon hike from Paradise Valley near Lake Louise via Wastach, Wenkchemna & Opabin passes. It was Allen who provided many of the Stoney Indian names for the peaks surrounding the lake. Named after Lieutenant Colonel Robert O’Hara, The region is rich in climbing history and J. J. MacArthur, Conrad Kain, Brian Greenwood, Don Gardner, and Charlie Locke have all left their marks. Painters have also loved the valley. John Singer Sargent was one of the first to visit in 1916, and since then many others have followed: Lawren Harris, Walter J. Phillips, Arthur Lismer, and J. W. G. “Jock” MacDonald. J. E. H. MacDonald visited every September for seven years, from 1924 to 1930. He wrote in his dairy “If there is truly a heaven, then I want a berth in the Lake O’Hara region of the Rocky Mountains.” Banff’s own Peter and Catharine Whyte spent several summers painting at Lake O’Hara and did some of their best work there. Today many of the Rockies’ finest artists visit the area to work their magic with brush and canvas. Renowned for its magnificent network of hiking trails, Lake O’Hara is a rambler’s paradise. Most of these trails were built by University of Chicago botany professor George K. K. “Tommy” Link and Canmore coal miner Lawrence Grassi. There are gentle lakeside rambles, rigorous mountain passes, and airy alpine routes. In other words, there is something for everyone. These well maintained trails link the valley’s numerous lakes: icebound gems like Lake Oesa, larch-framed Schaffer Lake, and alpine tarns like Sleeping Poet’s Pond. The Lake O’Hara Trails Club, established in 1949, works hard to maintain and improve these trails. 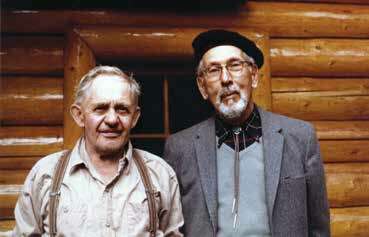 Lawrence Grassi and Tommy Link, who built many of the trails at Lake O’Hara. The region is also a mountain climber’s paradise with four 11,000 ft. peaks (3350 m) and a dozen lesser peaks accessible from the lake. Mounts Hungabee, Lefroy, Huber, Victoria, Odaray, and Cathedral Mountain are all worthy alpine objectives, while the Grassi Ridge on Wiwaxy Peak offers one of the finest rock climbs in the range. And a night at the Alpine Club of Canada’s Abbot Pass Hut, located at an elevation of 9,588 feet (2922 m) between Mounts Lefroy and Victoria, is an unforgettable experience. In the wintertime Lake O’Hara is a popular ski destination. Many people just ski up the snow-covered road for a day trip, but others overnight at the Elizabeth Parker Hut. And if you crave a little luxury, try a night or two at the Lake O’Hara Lodge, sitting around the blazing fire with a glass of wine and good company. Located in Yoho National Park, Lake O’Hara is on the British Columbia side of the Continental Divide. The starting point for your trip to O’Hara is a parking lot located just off the Trans-Canada Highway near Kicking Horse Pass, about equidistant from Lake Louise and Field. Here you catch the bus to the lake. Reservations can be hard to get so book early.